My first night at AIGA Minnesota’s Design Camp – found me at a table right across from the extraordinary designer, Paula Scher. I was at a special pre-conference dinner for the speakers, sponsors and media for the event. Seated next to me were Kim Shannon and Jamie Saunders – Neenah Paper reps that had brought me to camp to help them with blogging the conference. Kim whispered “She’s right there! Are you gonna try to get an interview her tonight?” It was more than worth a try. Paula’s design work for CBS records, Citi Bank and The Public Theater has made her legendary in the minds of designers everywhere. 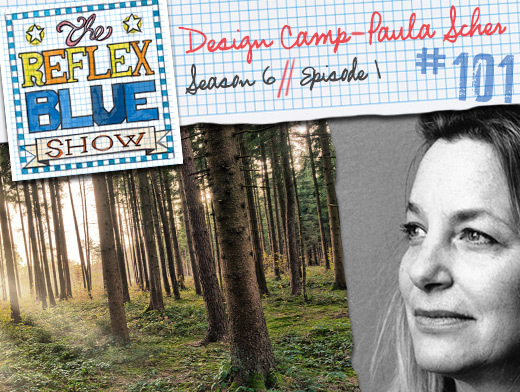 The Reflex Blue Show has been honored to interview the likes of such design greats as Chip Kidd, Robert Brunner and Jessica Hische – but Paula had yet to be on the show. I waited until the dinner was over and people were beginning to leave. When I finally approached Paula, I found her more than eager to sit down for an interview. I hope you enjoy our lively discussion about inspiration, discipline and balance within the design lifestyle – and stay tuned for more engaging interviews in Season 6 of The Reflex Blue Show.